This time last year, the Atlanta Falcons were 2-4 and were considered average at best. The team lacked talent, depth and were led by an inept coaching staff that could not push the team over the hill of mediocrity. 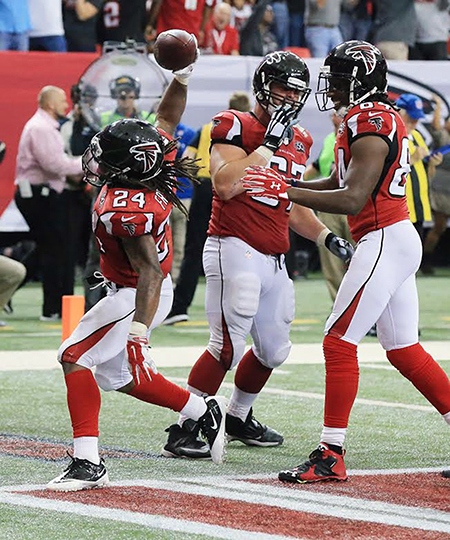 The 2015 Atlanta Falcons, at 5-1, are revitalized and poised to make a legitimate playoff run. They have been one of the more pleasant surprises in the NFL this season. For the most part, the Falcons’ roster is comprised of hold overs from last season. The culture surrounding the organization has changed. Dan Quinn, the former Seattle Seahawks defensive coordinator, was hired as the Falcons’ new head coach in February to establish a new identity for Atlanta. Not only has he cultivated change in Atlanta, but he has done it swiftly with the personnel from last year’s team. Quinn’s new approach and scheme has been exactly what the doctor ordered for the Falcons. His childlike energy and blue-collar work ethic has permeated throughout the locker room. His uncanny ability to rally the troops in crunch time has been evident in the first six games of the season, with the Falcons trailing in the 4th quarter of their five victories, only to comeback and finish the game with a W. These elements were missing in the last few years with the Falcons losing close games, resulting in only 10 wins in the last two seasons. Going into the season, the Falcons’ offense had the potential to be potent, but had questions on the offensive line and running back. So far, those questions have been answered with solid o-line play and the emergence of running back Devonte Freeman. Freeman has 10 touchdowns through six games, with two games scoring at least three touchdowns. Pro Bowl quarterback Matt Ryan has been steady as usual, and superstar wide receiver Julio Jones is playing at an MVP level, among the league leaders in receptions and yards. The offense is among the league’s finest, averaging 30.5 points per game. Even if the team has been erratic in spurts, they have found the resolve to get the job done. The defense has not been stellar but solid, playing sound football with energy and fervor. They have been dependable in key situations during games and have excelled against the run, giving up a league low 78.8 yards per game. The Falcons are far from invincible, but they are definitely improved. That was evident in the Falcons’ only lost against the New Orleans Saints, where they turned the ball over three times in Saints’ territory in a 31-21 loss. Given the impressive start, the expectations are building nationally. In some circles, Atlanta is overrated. No matter the outside perception, the Falcons are in the winner’s circle right now.